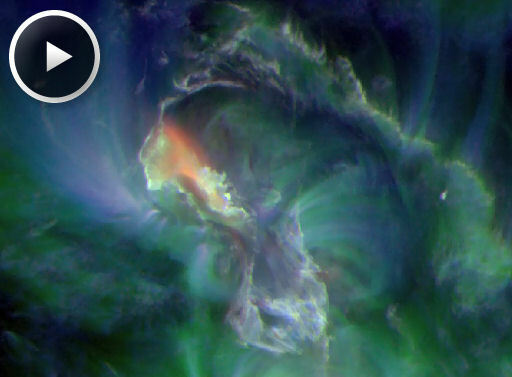 There are no large equatorial coronal holes on the Earthside of the sun. Credit: SDO/AIA. QUIET SUN: Solar activity is low. NOAA forecasters estimate a 15% chance of M-class flares and a scant 1% chance of X-class flares during the next 24 hours. Solar flare alerts: text, voice. "This is a 2-second exposure I made using my Canon 2Ti digital camera set at ISO 800," says Russell Vallelunga of Phoenix, Arizona. 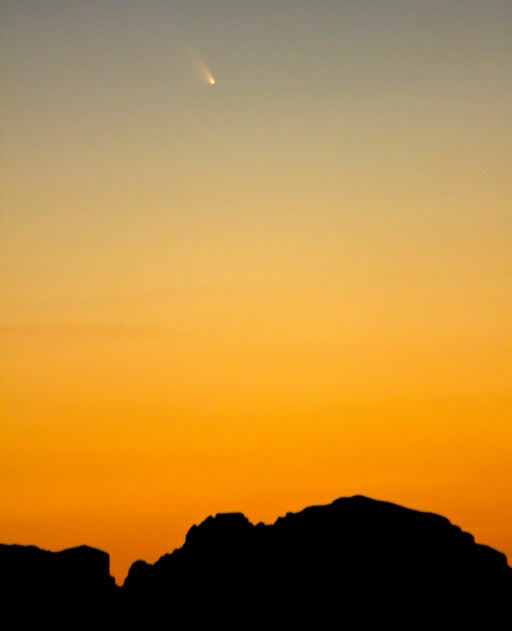 "Comet Pan-STARRS was even more impressive tonight (March 11th) than last night, being much higher in the sky." Add the crescent Moon to this scene and presto! -- a fabulous photo-op. Look low and west after sunset for the Moon and Pan-STARRS only a few degrees apart. Let the Moon guide you to the comet; it is visible to the naked eye if you know where to look. Binoculars are helpful, too. Sky maps: March 12, March 13. The source of the explosion was active region AR1690 on the sun's central meridian. Although AR1690 is almost directly facing our planet, debris from the blast might miss Earth. A CME emerging from the blast site appears to be heading mostly north of the sun-Earth line. Stay tuned for updates about a possible glancing blow in 2-to-3 days. Aurora alerts: text, voice. On March 12, 2013 there were potentially hazardous asteroids.